Chicago, Illinois: Theodora Press, 2014. Edition of 12. 5.75 x 4.875" closed. 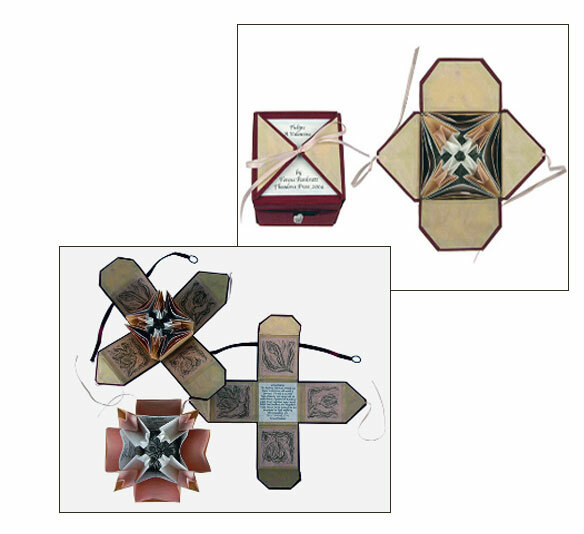 Accordion fold with detachable spine (back cover spine wraps around front cover spine and attaches/detaches magnetically). Decorative end sheets, cover image, and decorative image backing the accordion fold are archival pigment inkjet prints of original graphite drawings on lokta paper. Image and text for the front sheet of the accordion are archival pigment inkjet prints of original graphite drawings on Hahnemühle bamboo paper. 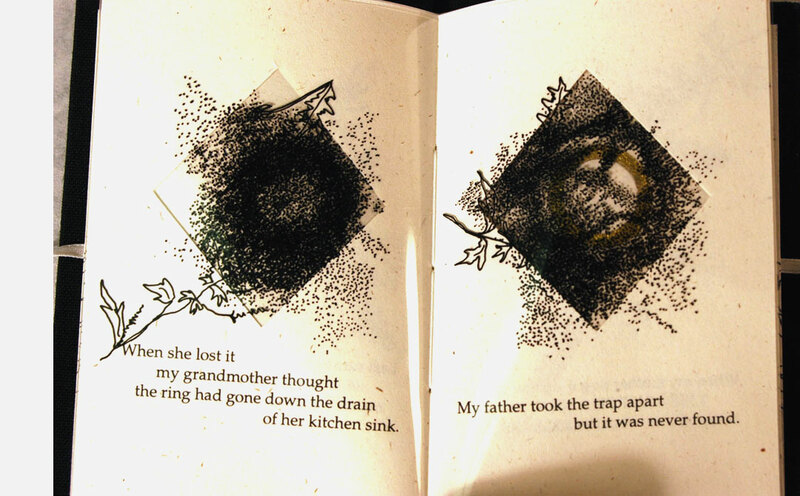 Paper cutting in images and along edges. Cloth covered spine(s). Signed and numbered on the colophon by the artist. The artist grew up in a small Kansas town and now resides in Chicago. Her work frequently explores the familiarity and security of the domestic and that sense of shelter being threatened or lost. Sheltered in Middle America is the artist’s response to climate change. The original graphite drawings were drafted on Midwestern highways. Chicago, Illinois: Theodora Press, 2004. Edition of 10. 7.625 x 2.25” closed; 7.5 x 14" extended. ; 10 pages. Double-sided-house shaped accordion. Images printed by thermography silkscreen. Text printed letterpress in 10 point Stone Sans. 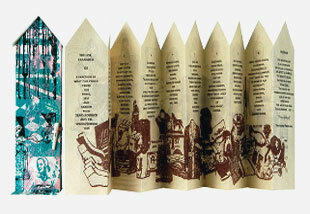 Housed in illustrated paper house-shaped stiff wrapper with bone & ribbon closure. Teresa Pankratz: 'The List, Expanded' is a list of a mere fraction of the thousands of articles available for purchase from the Sears and Roebuck Catalog in 1956, the year of the artist’s birth. (The original list appears as several of the daily entries of 'The Wish to Begin: A Journal', a one-of-a-kind artist’s journal using the visual resource of this same catalog.) Silkscreen printed in brown ink on Sakamoto lightweight to recall the catalog’s original yellowed pages, collaged items encroach upon the letterpress printed lists. Each of the silkscreened cases includes a unique collaged image cut directly from the original catalog." Chicago, Illinois: Theodora Press, 1991. Edition of 10. 7.5 x 13.25"; 28 pages. Accordion fold. 15 hand-colored etchings. Letterpress titling, ornaments, and colophon. Printed on Rives lightweight. 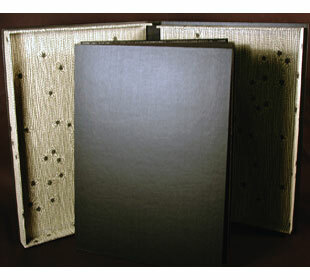 Bound in a top-fold accordion with gatefold opening. Signed and numbered by the artist. Teresa Pankratz: "Pas de Deux is a visual narrative depicting a couple's frustrated attempt at intimacy. Bound by self-imposed constrictions, they reach out – but never quite touch." This tale was inspired by a performance piece entitled Nothing Up Your Sleeve performed by Nan Shineflug and Jeff Abell of the Chicago Moving Company (one of the first modern dance troupes in the Midwest). The French pun – pas de deux as dance duet for two, and pas meaning not – underscores the point. The beauty of the etchings and the delicacy of the construction turn what might have been a vaudeville skit into a poignant story. Chicago: Theodora Press, 1989. Edition of 10. 12 x 10" closed, 16' 8" fully extended (with covers); 18 pages. Accordion structure. Text letterpress printed in 18 point Caslon on Arches Cover. Ten aquatints printed on lightweight Sakamoto. 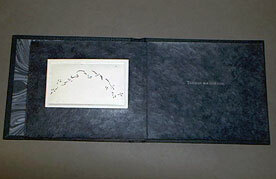 Housed in black clamshell box (13.5 x 11.25 x 1.5") with decorative spider etching used for pastedowns. 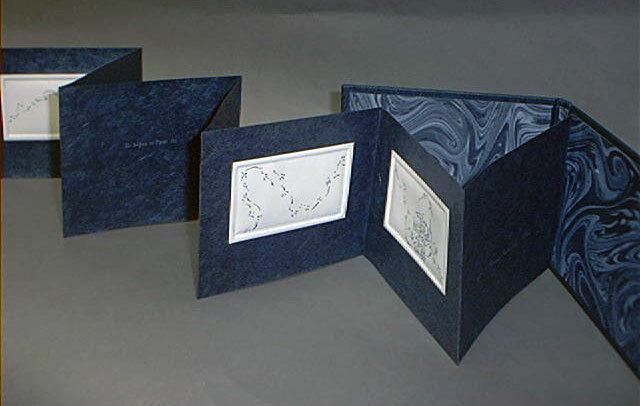 Interior and edges of clamshell box printed on Sakamoto lightweight paper. The aquatints, close-ups for the most part, suggest the immediacy of arachnophobia. The sharpness of focus both pinpoints the visceral fear and neutralizes it. Childhood terror recalled from the safety of adulthood? Art diffusing experience? Teresa Pankratz: "In a series of ten aquatints and accompanying text, this 'scary bedtime story' examines the titillating qualities of obsessive nighttime fears. 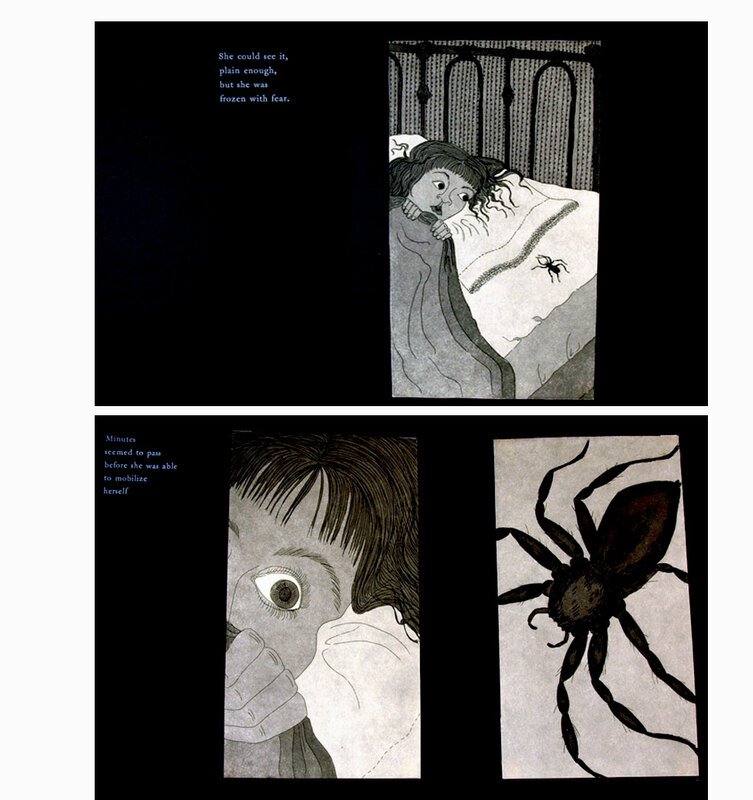 Through the visual device of fluidly changing points of view, the reader moves through the darkened bedroom, alternately on the spider’s hairy legs and from behind the child’s fear-crazed eyes. As nocturnal imagination takes over, the text relates that: 'her fear and frenzy became her pleasure.' The child finds herself “becoming” that which she fears most — and is unable to return to an untroubled sleep." 5 x 5.5";12 pages. Accordion-style structure. Bound in dark blue cloth over boards with marbled end papers. Inset panels of etchings with text . Mounted on blue Kuzuryu paper. Signed by the artist. Five drawings with accompanying text. This man is a bird man. Chicago, Illinois: Theodora Press, 1987. 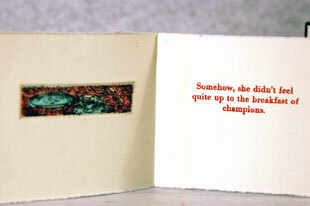 Edition of 14.
handcolored etchings printed letterpress on Rives heavyweight. Teresa Pankratz: "Six handcolored etchings ... depict the morning consumption of coffee and a donut." "Somehow, she didn't feel quite up to the breakfast of champions." Chicago, Illinois: Theodora Press, 1987. Edition of 9. 5 x 5"; 10 pages.Accordion fold with ribbon pull. Images silkscreened, then hand-colored. Letterpress printed in Bodoni Bold type onto Mohawk Superfine by a Vandercook Universal 1.Housed in 1.25" x 5.5" x 5.5" single bureau drawer box structure constructed of pink 4-ply board with wooden knob pull. Teresa Pankratz: "The inevitable passage of time is marked by the ever-decreasing contents of The Underwear Drawer." Teresa Pankratz: "I began drawing my dreams in January of 2015. I chose this practice for a number of reasons: to generate visual material, mark the passage of my 59th year, exercise my memory and, perhaps most importantly, explore the expansion of time. I had the idea that developing an active consciousness of the hours that I spent sleeping (and dreaming) would impact my perception of the hours, days - and years - available to me. I drew in graphite (using a .3mm mechanical pencil) and chose a 4" diameter circular format on 6 x 6" Stonehenge supports. I targeted the number '59' and disciplined myself to completing 5 drawings a month in order to produce a visual representation of the entire year. "As the months passed, and the number of drawings and dream texts grew, I began sharing them with other artists and friends. In these interactions, their 'bookness' - and their ability to connect to others' dream experiences - became apparent. 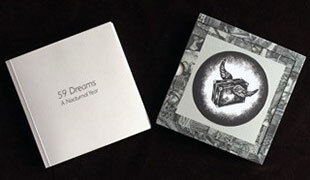 After I completed the 59th drawing (and, several days into the new year of 2016, turned 60) I began two book designs: the first, 59 Dreams: A Nocturnal Year, to include all 59 of the graphite drawings and their accompanying dream texts (available at a price that my friends could afford) and the second, Into the Night, a handmade, handprinted, and hand-assembled tunnel book, integrating the entire year of images into a series of four lithography panels." Chicago, Illinois: Theodora Press, 2016. Edition of 250. 6 x 6"; 128 pages. Soft cover. Perfect bound with French flaps and soft touch laminate. In hand-made slipcase with an original hand-printed silkscreen emblem. Signed and numbered by the artist. 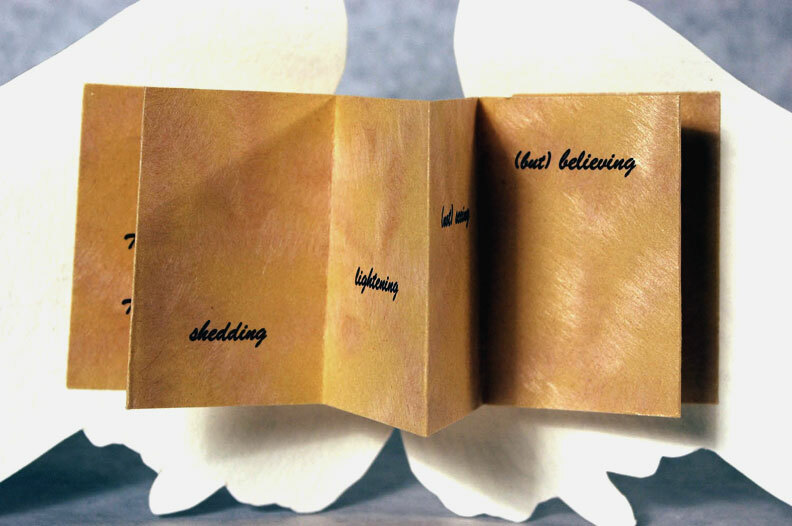 Teresa Pankratz: "59 Dreams: A Nocturnal Year is a visual and textual journal of a year of dreaming designed as an affordable, small edition artists’ book of 250 signed and numbered copies. It includes 59 dream images and their accompanying dream texts." Chicago, Illinois: Theodora Press, 2016. Edition of 15. 9.25 x 9.375" closed, tunnel book. Handcut and assembled. Seven original hand-printed lithographs. Printed at Hoofprint Workshop in Chicago. Handbound in a gatefold hardcover binding. Signed and numbered by the artist. 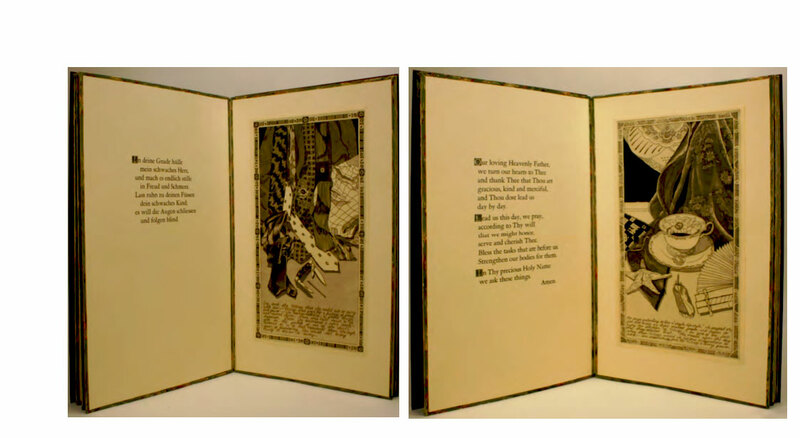 "Into the Night, a handmade, handprinted and hand-assembled tunnel book, integrating the entire year of images into a series of four lithography panels." Structure and design by Teresa Pankratz. [Evanston, Illinois]: Jane Fulton Alt / Teresa Pankratz, 2013. 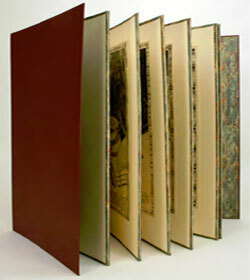 8.5 x 8.5 x 1"; 22 panels (12 text leaves, two double-page image foldouts, one trifold image section, 2 single leaf images). 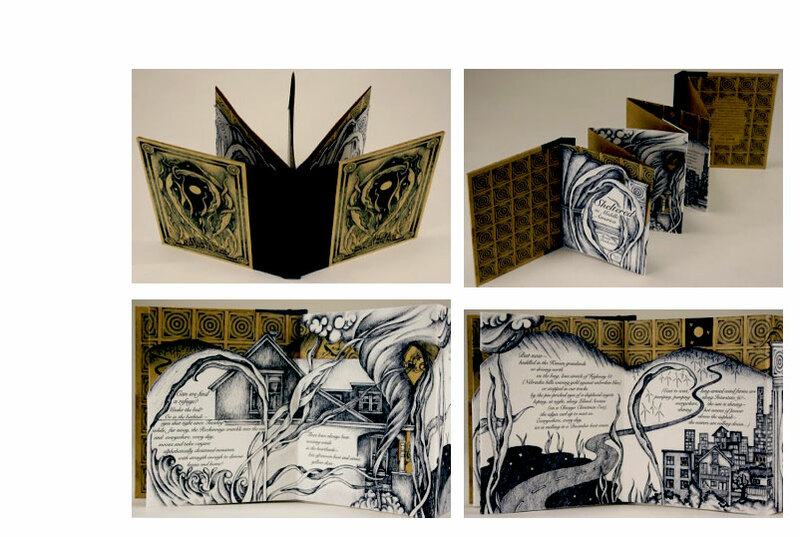 Printed and hand bound by the artists. Signed by the artists. Numbered. 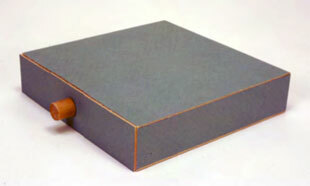 Jane Fulton Alt: "Bound in light grey ('smoke') Iris book cloth with silkscreened titling. The structure incorporates left and right covers with a magnet closure which, when opened, situate the text block as the center panel within a triptych of white space (Canson Ingres end sheets). The opening portion of the text block includes 4 sections (alternating between single and double-page construction) sewn to an exposed internal spine with a modified continuous pamphlet stitch. (Single-page sections are archival pigment prints on Hahnemühle photo rag; double-page sections are archival pigment prints on Niyodo Japanese paper). 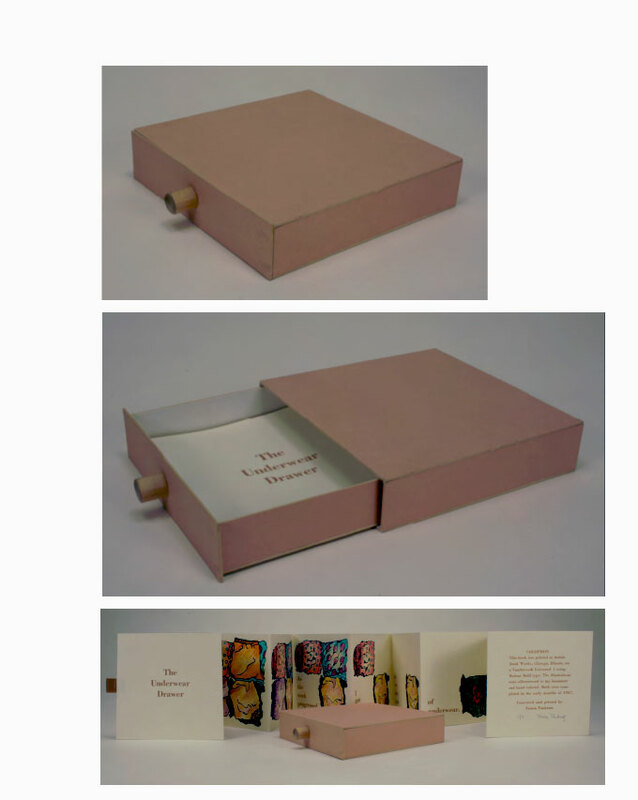 The attached back section of the book is an adhesive binding mounted on an internal 'frame' constructed of laminated 4 and 8 ply archival Rising White mat covered with Niyodo Japanese paper. Unfolding left and right are, first, two three-panel archival pigment prints on Hahnemühle photo rag, followed by a series of four text and image single-page archival pigment prints on Niyodo Japanese paper. The final unfolding reveals a unique, mixed media encaustic mounted (on black Stonehenge) within the internal frame. 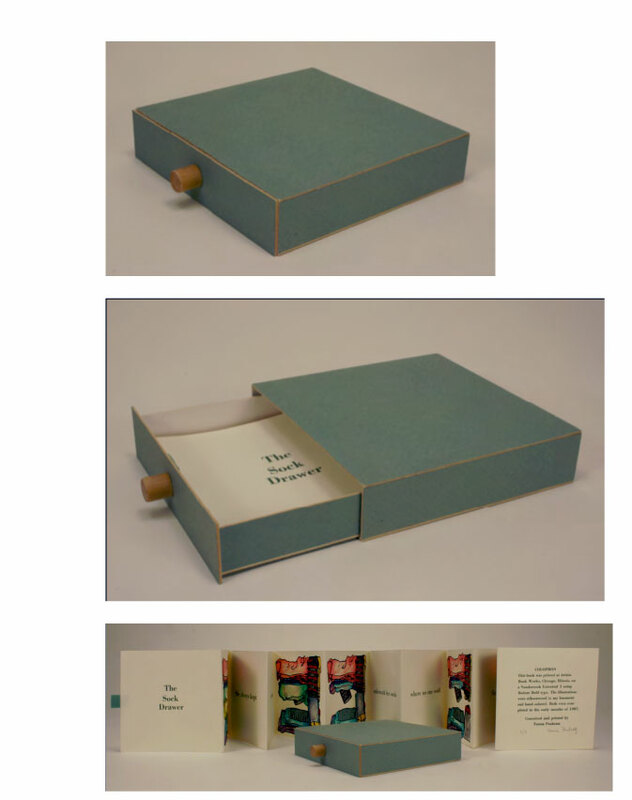 The book is housed in a slip-case constructed of an archival pigment print on pearl gray Murillo by Fabriano." 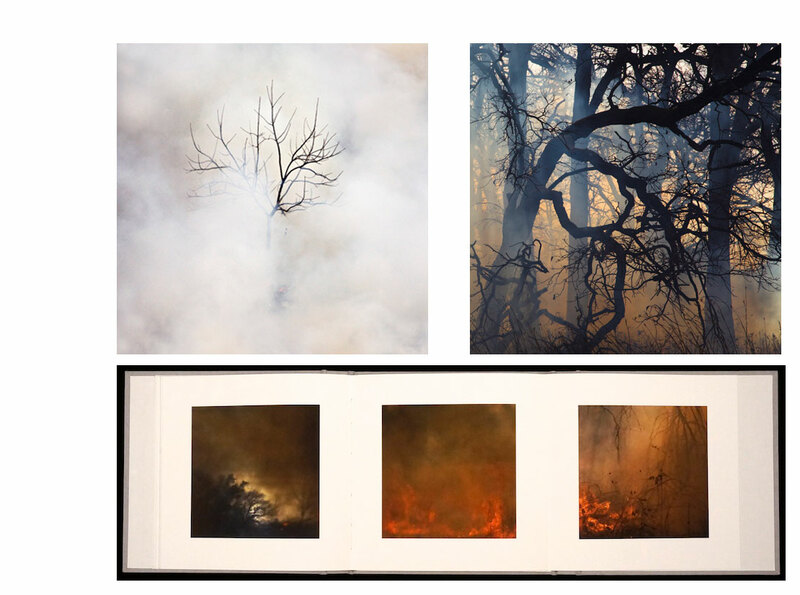 between fire/smoke is an unfolding visual and textual journey through a landscape of liminality – leading to a place where all that is unresolved is imaginable …"
Rfotofolio.org, interview with Jane Fulton Alt: "I collaborated with a book and paper artist in Chicago, Teresa Pankratz. When I approached Teresa about creating a book, neither of us had any idea of the scope of the project, as neither of us had ever collaborated with another artist before. We met weekly to discuss the form the book might take. What we came up with was beyond my wildest dreams. "Teresa had seen my exhibit in the Chicago area and wanted to include one of the encaustic pieces in the book, thinking of it as embedding a jewel in a book." Lenscratch.com, interview: "In 2007, my interest in the universal mystery of birth and death became personal. That spring, my first grandchild was born and my sister was diagnosed with cancer, all within the space of a few days. The juxtaposition of these two events stunned me. "At the same time, I witnessed a fire, a controlled burn in a nearby prairie, while attending an artist residency at the Ragdale Foundation outside of Chicago. Compelled by the visual and expressive potential of this man-made conflagration, I joined a team of restoration ecologists to photograph my first burn. 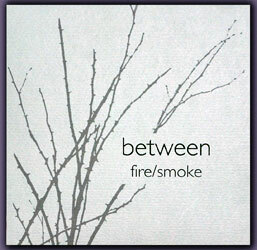 The smoke and the fire challenged me in ways I could not have anticipated and comforted me in a way I never expected. I have spent the last seven years photographing controlled burns in prairies, woodlands, and wetlands in Lake Forest, Illinois, while simultaneously watching my grandchild and sister follow their separate paths of rising into and falling away from life. "When looking thru the viewfinder the parallels between the burn on the prairie and the burn in my sister’s body were immediately apparent. Just as the fires were clearing the way for new growth, so too was the chemotherapy allowing healthy cells to replace the cancerous ones. Through creating this body of work, I was able to more fully understand and embrace nature’s inevitable life cycles." Chicago, Illinois: Theodora Press, 2005. Edition of 160. 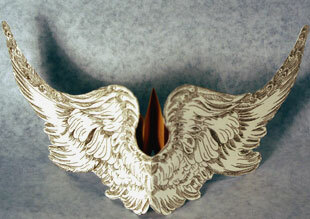 Wing-shaped outer pages (4 x 5.25" closed, opens to 10.5") holds a miniature accordion book with endpapers attached to underside of wings. 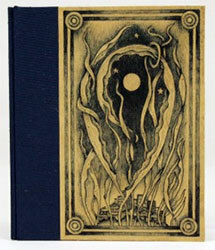 Etched cover is handprinted on Stonehenge. Miniature book (2 x 1.375") has 8 pages printed by laser jet in 14 point Brush Script on Hagakure. Chicago, Illinois: Theodora Press, 2006. Edition of 60. 4 x 3.25" closed, extends to 9.75"; 3 leaves. Printed by laser jet on acid free cover weight Royal Fiber. Text printed in Brush Script M7. Housed in 3.875 x 3.5 envelope with colophon tipped on. Teresa Pankratz: "This paper doll string of cookies was created in response to the 9/11 terrorist attacks. An earlier edition was included in [my] holiday greetings at the end of the year 2000." 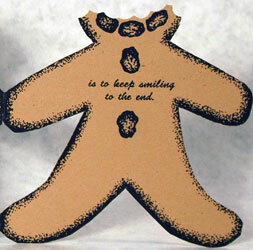 Text printed across pages shaped like a gingerbread man whose head is progressively chomped until only a smile remains: "Life is very unpredictable / so perhaps the best solution / is to keep smiling to the end." Chicago, Illinois: Theodora Press, 1995. Edition of 20. 4.625 x 2.875"; 12 pages. Laser jet on Speckle Tone True White Text. Transparencies are zeroxes of pen and ink drawings. Text is set in 9 point Palatino. 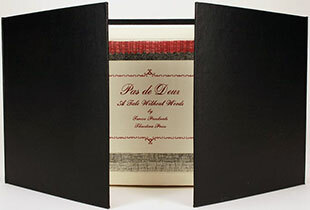 Bound in black book cloth with white ribbon closure. A wedding ring, missing for 20 years and presumed gone, is unearthed in the garden. 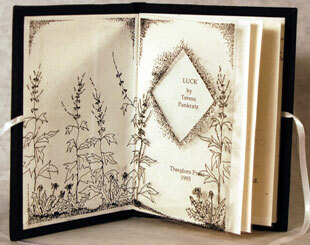 Pages which alternate between transparencies and cut-outs play out this manifestation of Luck. Chicago, Illinois: Theodora Press, 1989. Edition of 6. 22.25 x 13.25 x 1.5” closed, extends to 152"; 12 pages. Accordion fold. Five intaglio (aquatint) prints. Letterpress texts on Sakamoto lightweight using Garamond type with Caslon initials. 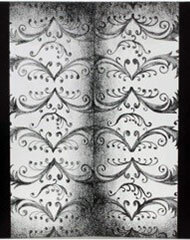 Mounted on a fourteen panel museum board accordion structure, each panel edged with marbled paper. Bilingual text: German and English. Teresa Pankratz, colophon: "A Morning Prayer was my father's prayer at breakfast. I've taken the liberty of varying the lines as he did when using his prayer at times other than the breakfast table. A Benediction is paraphrased from the King James Version of the New Testament. Julie Katharina Hausmann wrote the text So Nimm Denn Meine Hande in 1862. It is probably better known in our 20th-century churches as words to the hymn Take Thou My Hand O Father. The five aquatints were completed in 1988 after my father's death in March of that year. "The book is dedicated to my father Theodore W. Pankratz (May 20, 1923 to March 27, 1988) who was himself a lover and keeper of things and whose prayers protected our lives." This is the first book by Pankratz created under the imprint Theodora Press. 5 x 5"; 12 pages. Accordion fold with ribbon pull. Images silkscreened, then hand-colored. Letterpress text on Mohawk Superfine. Letterpress printed in Bodoni Bold type onto Mohawk Superfine by a Vandercook Universal 1. 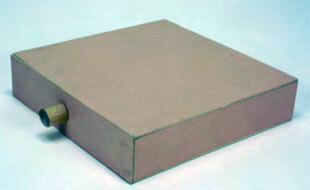 Housed in 1.25" x 5.5" x 5.5" single bureau drawer box structure constructed of green 4-ply board with wooden knob pull. Teresa Pankratz: "The Sock Drawer opens to progressively reveal a secret stash." And some stashes are more innocent than others. Chicago, Illinois: Theodora Press, 2004. Edition of 5. 2.5 x 2.5 x 2.5"; 4 pages. Text in 12 point Apple Chancery and printed on Karakusa paper. Inner tulip liner papers of folded Pink Mulberry and Hagakura. Tulip linocuts on the inside of the box printed on Pink Mulberry. Housed in drop-sided cloth covered box with ribbon closures. 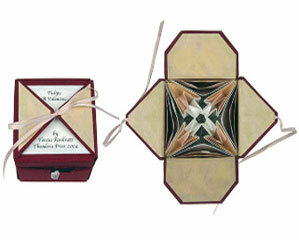 Teresa Pankratz: "Multiple layers of folded Japanese paper separate as this drop-sided box is opened and the innermost four pages becomes fully visible. revealing a text that begins: 'That time you were away/I bought tulips in January./For a whole day/they would not drink, /their heads/bowed/almost to the table/in sorrow…' The narrative of the progressive opening of these winter flowering buds is a love poem that unfolds upon the book’s innermost pages."